This picture is for her. She declared Saturday the 16th, Bernie Mac Day. 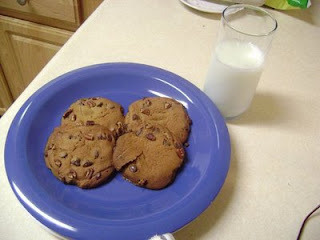 And to celebrate, you were to make some milk and cookies (from his famous stand-up bit. If you want to watch his "milk and cookies" bit, you can find it on YouTube. Be careful though. He's rather *ahem* vulgar.) and watch Bernie Mac Movies. I baked these turtle cookies in his honor. Don't be too impressed. These babies weren't made from scratch. I'd like to thank the good folks at Nestle for making that super easy Toll House cookie dough. And if you're reading this, Nestle, I'm expecting a 1 year supply of these cookies for this endorsement. Call me. The back of La Niña is done. I only have 6 rows to go to complete the front, then I'll start working on the sleeves tonight. 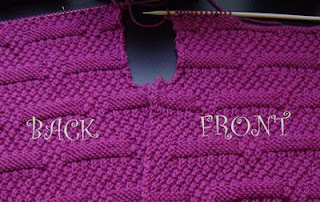 Do you know that there are some people who are already done with their Ravelympic knitting?!!! I'm not just talking simple hats and scarves. I'm talking ADULT sweaters with intricate cables EVERYWHERE. When I mentioned this to a co-worker, she said that they need to be checked for steroids. I'm inclined to believe that.